You have reached this page because you have signed-up for our quarterly newsletter. We know you will enjoy the news and information we send because it will help you save even more money over the life of your air conditioning and heating units. 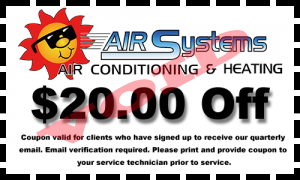 But to help you get started on your savings we want to give you a $20.00 coupon to show our thanks for signing up to recieve our quarterly newsletter. Please print and give this coupon to your service technician prior to service.